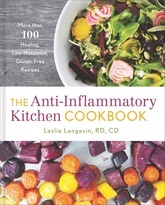 If you suffer from fatigue, migraines, eczema, allergic reactions, mast cell activation, celiac disease, IBS, chronic hives, or an inflammatory condition such as arthritis, these delicious low-histamine, anti-inflammatory, and gluten-free dishes will help you embrace the healing power of food. This must-have cookbook also features helpful lists of foods and supplements to eat and to avoid, cooking tips, kitchen hacks, recommendations for eating out, a month-long meal plan, and a selection of 15-minute meal ideas. Eating healthy never tasted so good!